A while ago, I went to my first UNC Asheville basketball game. It was a cold Saturday afternoon in the year of 2014. The wind was blowing hard and I clearly remember walking from Overlook Hall in heels and a tiny jacket, which was not very suiting for a cold afternoon. I was feeling grumpy that my roommates convinced me to go to the game before we would go out and take advantage of the good times Saturdays would usually bring. I must have been 18 years old at that time, feeling very foreign. 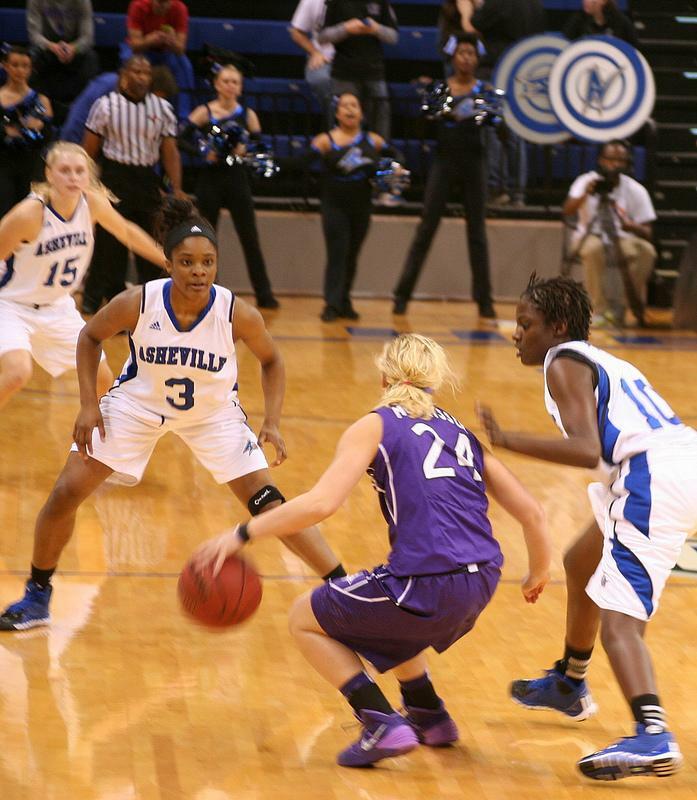 UNC Asheville women’s basketball team took on Furman at the Kimmel Arena Nov. 9 and won 68-65. Surprisingly, I was more worried about how I would be able to get alcohol in America rather than watch my very first college basketball game. After all, I made it to the game, got seated and observed the crowd: kids, elderly, people of all ages and figures were laughing, eating and cheering while censored hip-hop music blasted on the speakers. I looked around and observed the fan attire people were wearing and felt very stupid in my “Saturday night outfit.” The atmosphere was hyped and I felt like I was in the middle of a TV show. At that time, I did not see the point of supporting a non-professional, college team as much as the people attending, and they were even paying for it while spending a Saturday afternoon watching the game. I went to a few more games just for the fun of it; honestly it was not very appealing to me. The excitement and the aspect of almost glorifying the players seemed odd to me. I found it comical that “regular student athletes” were treated like celebrities, but I took it as part of “my American experience.” I know how sports make up a huge part of American culture and comes with a sense of pride. This excitement and praising of the basketball players was not just visible on court, but followed them wherever they went: in the classroom, at the library as well as the cafeteria. I observed how they were dressed in confidence, wearing it outside their clothes, as a thick jacket, always walking with their head held high. Maybe I was the only person noticing the high self-esteem, seeing it as pure arrogance because of my own cultural background. Growing up with the “Jantelov,” a big part of Danish culture, which defines your status in society, making sure no one ever thinks too highly of themselves or others. For sure, “Jantelov” didn’t seem to exist in the mindsets of the players nor the people praising them, and I did not like it. The following year, the same prejudices were a big part of my impression of the players and my own ignorance grew during my time at UNCA. No basketball player would get my full attention or admiration. My first years went by and on a sunny day last semester I began working with the In Real Life program along with the Asheville Middle School. Once a week I went to the school to work with the kids, who honestly did not like me. They did not want to be there, they did not understand who the hell I was and why they should listen to me. I clearly remember walking into the cafeteria and meeting the rest of the volunteers before the afternoon with the kids would begin. I recognized a tall girl with brown African-inspired micro braids tied into a big bun, standing in the cafeteria with crutches supporting her knee: Tiffany Wilson. She had helped the UNCA Women’s Basketball team win the regular season title as well as the championship the previous year and had just gone through surgery, forcing her to redshirt her junior year of college, but she was still standing in the middle of the cafeteria getting ready to be a part of the IRL program. Later, another key player from the team, Bronaza “Bree” Fitzgerald, joined the program along with Wilson to help out at the middle school. I will never forget the excitement of the kids, the light in their eyes, the smiles on their faces and their suddenly increased engagement when Fitzgerald and Wilson were mentoring them. The authority and respect, as well as love and care the two girls brought to the kids was life changing to experience, not only for the kids, but also for me and the other volunteers. By the end of the fall semester at the annual Athletes Grade Comparison, where the teams with the highest GPA are honored, my tennis team went third with a team GPA of 3.5, the golfers were second, beat by the women’s basketball team with an almost perfect GPA score showing their excellence in the classroom. Along with this, my freshman year two women’s basketball graduates had a perfect 4.0 and went to medical school after four years being full-time athletes as well as students. Others became mentors or coaches for high school teams pursuing the greatness they were capable of. Spending time with some of the players, observing them, filming their games and working with them made me realize their unique capabilities, strong mindsets, hard work and dedication on and off the court. Chatori Major just broke the school record scoring 31 points in a game. As well as being the best player in our conference, Major is one of the most humble, friendly and spacious people I have met. Getting to know the players and having experienced their journey, their excellence in the classroom and in our community, as well as their humble personalities, made me feel very embarrassed by my ignorance and arrogance I had created without a valid reason. Lastly, I now believe the basketball women are much more than just “regular student athletes.” They are individual leaders pursuing the greatness in all aspects in life. I strongly believe they will become something special in their futures. Personally, I’m thankful for my changed mindset and I am sure I am not the only person positively influenced by them. Leaders to follow are leaders in real life.